The mixer can be optionally toggled by clicking on the Mixer View on the Layout tab. The layout tab responsible for your score layout. For more window real estate when composing your piece, it is advisable to hide the mixer window by clicking the Mixer View again, or by clicking on the small “x” at the top right hand corner of the mixer window. The master controls are global controls that update the entire score’s attributes globally. It also displays the current measure, beat and page number of the score during playback or during scrubbing. The tempo can be updated in real-time while the score is playing by moving the slider. Furthermore, the global volume can be adjusted by clicking the space slightly below the slider bar. Let’s say you adjust the bpm for a piece from 132 at 100%, to 160 bpm. The tempo starting point has now changed, and 200 bpm is now at 100%. This is the master volume of the entire score. You can play your score here. The shortcut for toggling playback is Space. You can also scrub music as well. The shortcut for scrubbing music is Z. Each track in a score will have its own control. The control for a track is aimed at changing settings for that track specifically. You can change the volume in real-time of the specific track by sliding the slider up and down. You can pan a channel in real-time to the left or right speaker by rotating the knob. The channel panning is good for creating stereo effects. You can mute a track in real-time. You may want to mute a track if you wish to limit just one or two tracks in a large score. These settings also affect music scrubbing. You can solo a track in real-time. You may want to solo a track if you are composing a part. These settings also affect music scrubbing. There is an area right below the volume slider, indicated by #3 in the diagram, that you can click to bring up the track settings dialog. The track settings affect just that track. 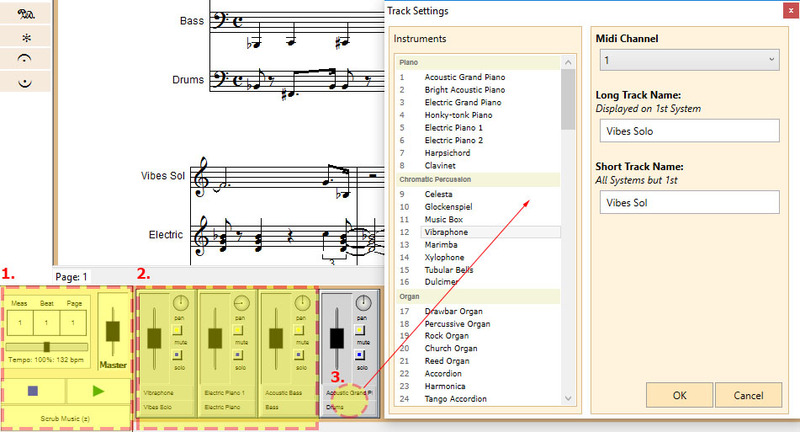 You may choose an instrument for playback in this section. You can choose up to 127 standard midi instruments, but if you have a sampler, such as Kontakt, these settings will be overridden. The midi channel can be selected here. Each midi channel can hold up to one unique instrument, and channel 10 is specifically dedicated to the drumkit. You will hear the standard midi drumkit play back no matter what instrument is selected. Again, this can be overridden if you have a sampler, such as Kontakt. Long Track Name: This name is displayed on the first system only. Short Track Name: This name is displayed on all systems but the first.